Language is used not only for communication but also for enacting multiple identities to reveal information about oneself such as who we are, where we come from, who we believe in etc. This is done by means of using a tribe, gender, region or a country specific dialect, accent, sociolect, vocabulary or phrase to identify oneself with a specific tribe, gender, social class or ethnic group, a region or a nation. Greetings such as-‘Assalamualeikum’ (‘peace be with you’), ‘God bless’, ‘Shalom’ (‘peace’) are used by people to identify oneself with a particular faith (Muslim, Christian and Jewish respectively). Thus, language use serves here as a means of constructing religious identity. Region and tribe specific dialects, accents and sociolects are also used to construct regional, social class, ethnic or tribal identities. This process of identity construction occurs both in the real world as well as in a virtual reality on-line, where people can either take their real identity with them or construct an on-line identity that can be as divergent as they wish. As on-line communication gains significance in everyone’s life, research on the nature of this communication is required to uncover various underlying issues governing this type of communication. In this respect, the present study aimed to explore the strategies and ways in which language and other means were used by Saudi Arabian youths to construct and enact their various identities such as gender, social class, tribal, regional, religious etc. To this end, a social networking website was designed and Saudi youths (aged between 18 to 30 years) were invited to participate by posting and chatting online on the website. Of such posts, around 300 comments were selected for the content analysis. 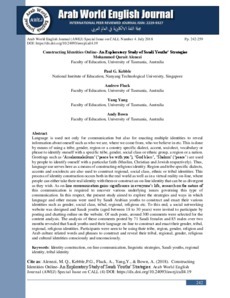 The analysis of these comments posted by 71 Saudi females and 85 males over two months revealed that Saudi youths used their language on-line to construct and enact their gender, tribal, regional, religious identities. Participants were seen to be using their tribe, region, gender, religion and Arab culture related words and phrases to construct and reveal their tribal, regional, gender, religious and cultural identities consciously and unconsciously.